Author Robert Short uses ‘Peanuts’ cartoons such as this one to demonstrate the presence of religious messages in the popular comic strip. Reading comic strips isn’t just good for a laugh, it’s good for the soul as well. No one knows this better than Robert Short, author of the bestselling “The Gospel According to Peanuts ,” America’s No. 1 nonfiction bestseller in 1965, and one of the nation’s top all-time religious bestsellers today. The book, which uses Charles Schulz’s “Peanut” characters in parables about basic Christian beliefs, continues to break sales records and has been translated into 10 foreign languages. Short, who presents programs throughout the United States and several foreign countries on Christian values found in popular culture, literature and art, will present two lectures at Morningside College on Nov. 13 and 14. As part of the Morningside College Wright Memorial Lecture series, Short will speak on The Gospel According to Peanuts Tuesday evening and “Calvin and Hobbes and Christ” Wednesday morning. Open to the public, both lectures are free of charge. That’s easy to do, Short says, because in the case of “Peanuts,” the late Schulz did such a good job of intentionally injecting religion into his comic strip. Short attempts to communicate theology in an indirect or parabolic way, using the two comic strips as modern-day parables. The programs include comic strip slide presentations that illustrate scripture from the Bible’s old and new testaments. When one is familiar with the Bible, Short says, they can see the message being spoken in a lot of comic strips. Short mirrors that message with God’s attitude toward people. “God doesn’t love us because we’re good, he loves us in spite of the fact that we’re not good, just like we love Calvin in the strip,” he says. Short stumbled upon the popular slide show idea in 1965 as a 28-year-old pastor working his way through seminary. 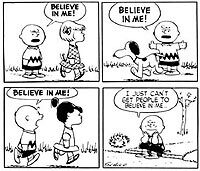 Using Schulz’s characters to explain the Christian faith, he explained that Lucy, in her headstrong impulsiveness, often represents original sin. Short also depicted how Schulz used Snoopy to stand for Christ or ideal Christians. Dr. Bruce Forbes, chair of religious studies at Morningside College, says the appeal of Short’s books and presentations is that they’re not preachy and show how religion is often a part of life. The message is subtle and light, Forbes says, and doesn’t hit people over the head. Instead, scripture is occasionally quoted or characters talk about church. It’s a theme Short calls, “Christianity without doom or gloom” — where eternity isn’t divided into two separate compartments, smoking or non-smoking, where people go either to heaven or hell. Robert Short’s book “The Gospel According to Peanuts” was a No. 1 bestseller in 1965. “When you read the New Testament and take it very seriously and read it carefully, you’ll see that ultimately nobody is going to end up in eternal damnation. Absolutely no one,” Short says. In addition to Gospel, Short also has written several other highly successful books of popular theology, including The Parables of Peanuts: A Time to be Born and Short Meditations on the Bible and Peanuts, among others. He sees his book and presentations as a way of conveying good theology, which nowadays is in short supply.